Still no plans for tonight? If not, you can join us at the Niehoff Urban Studio (2728 [Short] Vine St.) at 5:30PM. We've been invited to participate in the Soapbox Speaker Series panel discussion 'art lessons' ...along with Kennedy Heights Cultural Arts Center and Clifton Cultural Arts Center. This event, hosted by Soapbox should be a good way to meet us and some other impressive arts organizations in the city. Clicking the first image or this part of this sentence, will link you to a page with all of the details. By clicking the second image above or this part of this sentence, you can read more about the art centers featured in the panel discussion. 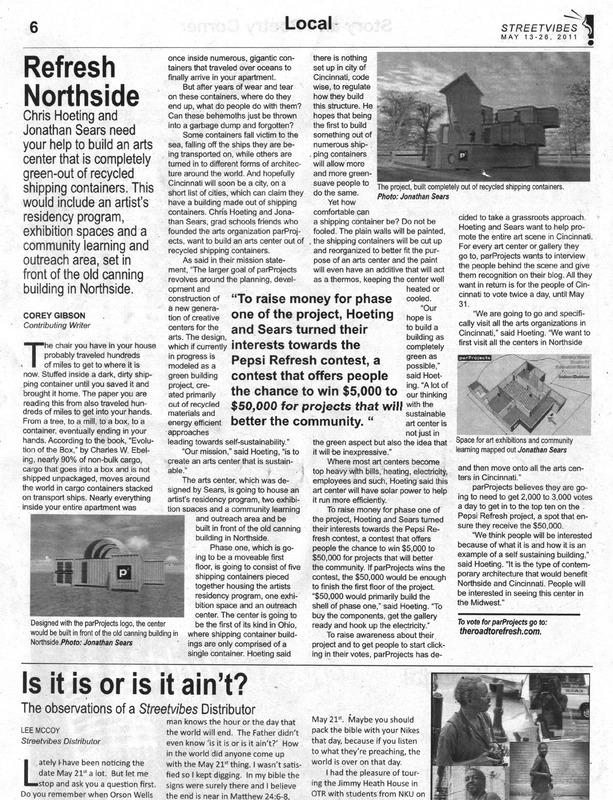 And before we forget, we'd like to send a big "THANK YOU" to Geoffrey Dobbins for including us in the article. It is greatly appreciated. Since we aren't starting our big push for another week or two, we thought now would be a great time to mention we're still accepting sponsorships for our next event: The Factory Square Fine Arts Festival. To learn more about these exciting opportunities to join our team, you can link to the project site here. Also, as we continue seeking event sponsors, we'd like to thank ArtsWave, Fuel Cincinnati and The American Can Lofts for helping us get the ball rolling. Your generosity is greatly appreciated! Of course you've heard of the Midpoint Music Festival , but have you heard of the Midpoint Midway? Click here or the image above to read about parProjects' involvement in this box-truck arts festival that will be happening in conjunction with the MPMF concert series. Thanks again ArtWorks for involving us in your exciting project! We're glad we could offer lessons learned in our past experiences to help with your planning of the event. We're definitely looking forward to it all. Mark your calendars folks: MPMF is Sept 22nd - 24! Great news: Over the weekend, we recieved our first ArtsWave project grant, so we'd like to take the time out to say "Thank you!" The Factory Square Fine Arts Festival -- so we sincerely hope you'll be able to join us in celebration of the arts ...and true, community programming. More information about this event can be found at the project's blog site FactorySquareArts.com or on its Facebook event page, here. And being that the event "officially" kicks off October 22nd & 23rd 2011, now may be a good time to mark your calendars. While in the midst of the Pepsi Refresh competition back in May, we were featured in Streetvibes issue #199. But, due to the chatic nature of that promotion ( of TheRoadToRefesh and our Art & Education Center design), we are just now finding the time to post the article. Please excuse the delay and click on the image below ( or HERE ) to open a larger, more legible version of the article. THANKS to the first 50! In June, when we added the spinning globe, international-hit/stat-counter, to the bottom right of our site (the flattened version is above), we had no idea what to expect. We just thought it would be a fun way to keep up with how many states and countries were finding our website and research online. But now, since the stat-counter server is about to go down for "a few hours of maintenance" tomorrow, we thought we'd post this ...just in case our stat info disappeared somehow. To say the least, we're definitely surprised with how it panned out ...as 50 countries found our site(s) before all 50 states (at 32 states when posted). We've had a couple radio interviews (and another print article -- which we'll launch soon) that we forgot to share with you all. So, please, click the links below if interested in hearing a bit more about what we're up to. "Movement!" our exhibition at Clifton Cultural Arts Center closes tomorrow (Saturday, Aug. 6th), so that means if you'd like to see what all of the hype is about, you need to get over to 3711 Clifton Ave as soon as possible. Just ring them at 513-497-2860 if you need more details. With that, we'd like to thank the CCAC for their hospitality, staffing, and all-around pleasantness as they helped us pull off this exhibition (and allowed us to transform their space). It was a delight! And don't worry, if you LOVE kinetic sculplture like us, "Movement!" part 2 will be opening this fall as part of the Factory Square Fine Arts Festival in Northside. Click HERE to visit that event page ...or the link to the right to sign up for updates via facebook.